At the City Park in North Bonneville, I spotted a family of five Bigfeet and Littlefeet plus more Littlefeet frolicking in the trees. Maybe it’s because Bigfoot hunting is prohibited in Skamania County. Or because the residents of North Bonneville were welcoming and friendly. 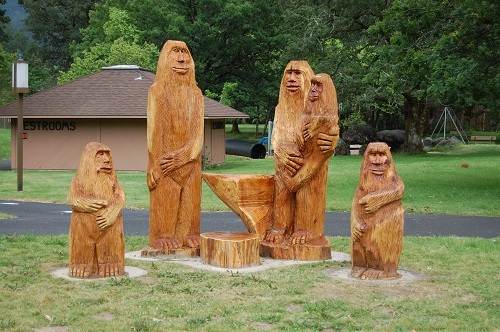 But this family of Sasquatch (or is it Sasquatches?) has moved from the Cascade Forests to this small town that was built for the workers on the Bonneville Dam project in 1934. Large footprints guide you to the various Littlefeet who seem to be hiding in the trees at the park. But if you look closely you’ll see them and the Littlefeet are very curious about humans and hardly shy at all unlike their Bigfeet parents, so you may find yourself talking to them. Birds, squirrels, owls and rabbits live in perfect harmony with the Bigfeet and Littlefeet in this park. Skamania County is the only sanctioned “Sasquatch Refuge” in the world due to the large number of Bigfoot sightings in the Gifford Pinchot National Forest, so if you’re a fan you should put this place on your visit list. You won’t regret it. Have any of you spotted Bigfoot? 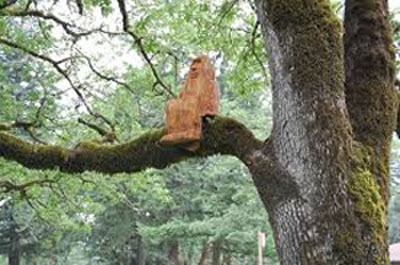 This entry was posted in Family Fun, Free, Roadside Attractions and tagged bigfeet, BigFoot, Bonneville Dam, Gifford Pinchot National Forest, littlefeet, North Bonneville, Sasquatch, Skamania County on July 16, 2012 by admin.